My thesis project studied the feasibility of using a fiber reinforced polymer bridge deck developed by Strongwell of Bristol, TN. The deck is made from off-the-shelf structural members from their Extren line of products. 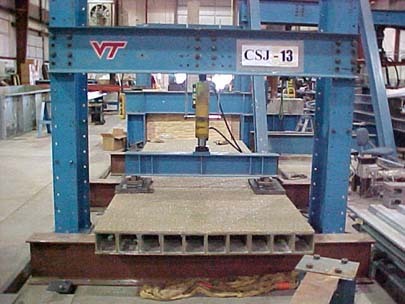 The deck was assembled at their plant in Bristol and then shipped to the Virginia Tech Structures lab in Blacksburg, VA. We have fitted the deck with various instruments to measure the effects of loads upon the deck. Lab Testing An FRP Deck Specimen. This is looking at the end of the deck while I have the loading frame and actuator in place. This is loading the West span of the FRP deck. Here is a closer look at the hydraulic actuator in place. 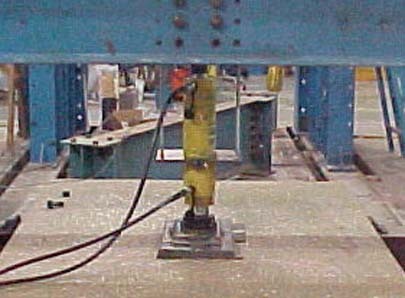 This is loading the center of the West span, whereas above is loading the edges with a spreader beam. This is looking South on the ramp to the truck weigh station off of I-81. The dark marks along the bed are the grout beds for the support beams, which can be seen in place below. Here is the deck being lowered on to the support beams. You can see lots of pipes and wires on this end. 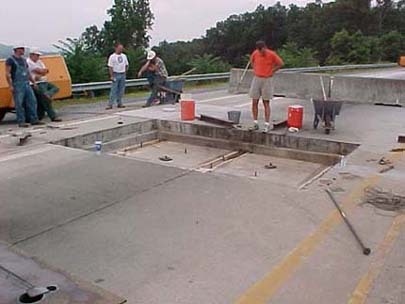 Those are used for testing the deck while in place. A picture taken by my co-researcher, Aixi Zhou. Dr. Zhou is currently researching composites in Swizterland and learning to ski. Meanwhile, I’m still living in Virginia. All the wires you can see in the foreground are connected to strain gages throughout the deck, which monitor very small changes in length. By the way, isn’t odd that engineers spell gage without a "u"? 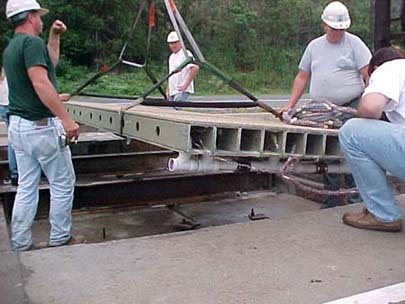 Strognwell’s Special Products Page – Check out Bridges & Decks section for some info on this and other projects. 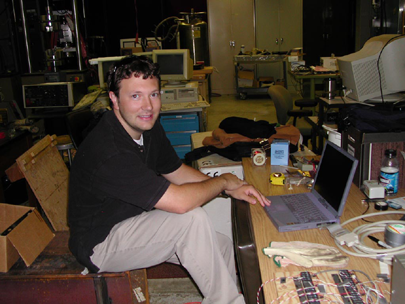 Notice: The images and information concerning this experimental project are the sole property of Virginia Tech and are not to be used or reproduced under any circumstances without the permission of the University. They are posted here for reflection and informative purposes only. This information may not be used for commercial purposes and the Creative Commons license which pertains the rest of JasonColeman.net does not apply to this page.